The final 2018 numbers are in, and the data confirms that the Austin real estate market continues to be on the rise in the urban core. When comparing the numbers from 2017 to 2018, the median price, median price per square foot, overall dollar transactions in the urban core, highest price per square foot, and highest overall price all increased from 2017 to 2018. For example, the median price of a home in the urban core in 2017 was $434,000; in 2018, that same number increased to $450,000. The median price per square foot back in 2015 was $273.38. That number has increased almost $50 per square foot over the past 4 years, resulting in a median price per square foot in 2018 of $320.64. Will prices continue to be on the rise for 2019? With Apple’s company announcement and the arrival of a major league soccer team in ATX, expansion and growth do not seem to be slowing down anytime in the real estate market of Austin, TX. 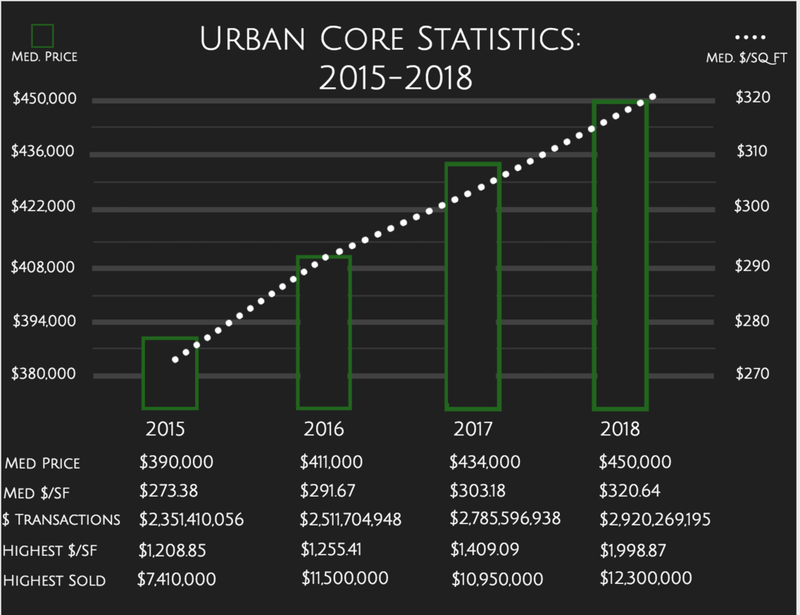 Check out my urban core trends and market analysis below! For more market statistics and analysis in the downtown area specifically, click here! Are you considering purchasing a property in the urban core of Austin? Jump in now before prices continue to rise! Contact me today to help you find the home of your dreams!